A microcontroller is a system which works on bits and bitstreams more than analog signals, anyway, those signals are still widely used in many fields especially in audio and power applications. An Analog to Digital Converter (or ADC) is a system that converts such kind of signals in a sequence of discrete values directly interpretable by the microcontroller. Such kind of converter is widely used in embedded systems to deal with those peripherals which work with analog signals like potentiometers, analog microphones or sensors. Analog sensors which produce a voltage level proportional to the measured property, like industrial temperature sensor which usually are made with a calibrated Diode. A 2-axis joystick you probably have seen on the PlayStation controller. 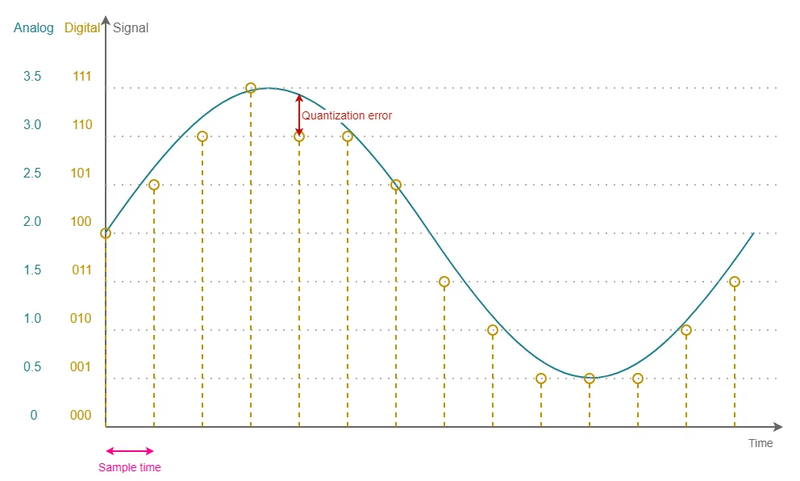 Each axis is actually a potentiometer and it is possible to read it using two channels of the STM32 ADC. We wrote an article about that. The guitar pickups are actually a pressure sensor which is able to convert air pressure variation produced by chords vibration into an electric signal. 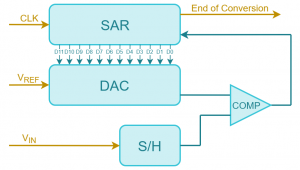 Once a signal has been sampled with an ADC, it is possible to manipulate it digitally. Considering the guitar pickup example, after the conversion, it is possible to use the microcontroller to apply digital sound effects, for example, equipping the guitar with a small PCB which mounts a micro and few electronics. Cool right? Yeah, and the coolest part is that someone created a prototype base on this idea (take a look if you want). The theory related to the ADC is particularly large and there is a lot of literature about this topic. The converters are indeed largely used in many fields which go from the Laboratory Test Equipment to Microelectromechanical systems. Because of that, there are many implementation and variants of them to match all the different needs. In this chapter, we would just explain a few concepts you should know to deal with ADC. An ADC converts an analog continuous-time signal in a digital discrete-time signal. For example, in the next figure, we can spot a time continuous analog sinusoid in blue and the digital version of the same signal in orange. The first notion we want to introduce here is the Resolution which represents the number of discrete values that the ADC can produce. The sampled values are stored as binary code, a power of 2, and the ADC resolution is often expressed in bits more than in absolute value. In the previous example the ADC was able to produce up to 8 different value (from 0 to 7 or in binary from 0b0 to 0b111): in such case, we can state that this ADC has a 3-bit resolution. To avoid sensitivity reduction as well as distortion or noise introduction, the input of an ADC is a clean conductor with no protection diodes nor conditioning circuitry and this means that user shall pay attention to provide signals which amplitude is coerced in the proper range. To measure signals which are out of range indeed the signal shall be usually conditioned by external circuitry. An example of conditioning circuitry is that used in the vertical channels of oscilloscopes which are even configurable allowing to select between Alternate and Direct Coupling as well as tune the FSR. Back to the previous example, the value 0b111 correspond to a 3.5V input and 0b0 to 0V. Thus we can state the ADC has a full-scale range of 3.5V. As seen in the previous example, the LSb of the binary code has a value of a half volt. This means we will not see any output variation if the input is 0.5V or 0.9V: both will be converted as 0b001. If we amplify the input signal with an external circuitry trying to overlap the whole input range we would make better use of our digital representation space. Indeed, in such case, we will use all the 16 symbols (instead of only 7) to represent the sampled version of our signal. The next figure shows the result of such operation: we can see the quantization error is still there but we have a lower information loss. If the quantization error is still too big for our application another solution could be to increase the representation space of our digital output or in other words to use an ADC having a better resolution. The ADC samples the signal each while. Usually, the time elapsed between two samples remains constant in time and takes the name of Sampling time or, considering its reciprocal, we have a frequency named Sampling Rate. In our example, the sampling time is represented by the pink arrow. Note that usually sampling frequency is measured as Samples per second (S/s) and multiples (kS/s, MS/S or GS/s). 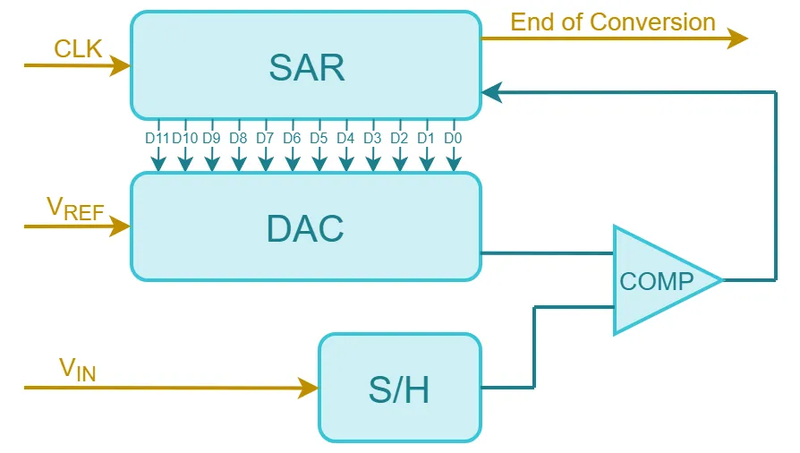 In certain cases having a constant sampling cadence over time is a requirement of the application and in those scenarios, the ADC is usually triggered by an external entity which ensures a proper timing (for example a hardware timer). An example of an application which requires such precision is audio sampling whereas you often would convert an analog audio signal in a Waveform Audio File Format (or .wav) which is usually a PCM having a constant bitrate (usually 44.1kHz, 48kHz or 96kHz). Note that maximum sampling rate sets a constraint on input signal maximum frequency we are able to perceive: we are blind on frequencies greater than half of the sampling frequency as Nyquist states. A Sample and Hold circuit which samples the input voltage and keep it unchanged until the end of conversion. This circuit requires a certain Sampling Time usually expressed in clock cycles to do its job. A Digital to Analog Converter which purpose is to convert a binary code into a voltage (its behavior is the dual of the ADC). A Comparator which purpose is to compare its inputs. The result of a comparison is a logic level that indicates if the DAC output is greater or smaller than S/H output. The Successive Approximation Register which is a complex logic which scope is to provide an approximated binary code to the DAC and, when the conversion is over, the output of conversion. The input is sampled in m clock cycles by the sample and hold. The SAR set the bit D10 to ‘1’ while D11 depends on the previous cycle. Each STM32 ADC has many input sources usually named channel, anyway, the ADC can sample one channel at a time thus the channels are multiplexed. These channels are identified with a progressive number starting from 0, the first 16 channels are usually assigned to external sources (e.g. are connectable to the outside world through the GPIO peripheral). Other channels are internal sources like the VBAT (e.g. the voltage of the backup battery usually used to keep up the Real Time Clock) or like the VTEMP (e.g. the voltage of internal temperature sensor). External inputs are assigned to some specific GPIO which shall be configured in Analog Mode to ensure the proper connection with the ADC. You can find information about these assignments exploring the Datasheet of the STM32 and you should also take a look at the article Using STM32’s GPIO with ChibiOS’ PAL Driver if you didn’t. To guarantee flexibility the ADC is able to convert also a group of channels organized is a user-defined sequence. The sequence can be configured acting on some registers known as ADC Sequence Registers. Usually, those registers are three (ADCx_SQR1, ADCx_SQR2, and ADCx_SQR3) and the maximum sequence length is 16 anyway this can vary across different microcontroller even if working principle remains quite the same. Each sequence register is split in many bit fields representing an element of the sequence and in the first register, there is also a bit field representing the length of the whole sequence (actually length minus one, for instance, if we store 3 in it we are stating the whole sequence length is 4). If you are not familiar with shift and bitwise operators you should definitely read Registers and bit masks which is a short article that explains how to deal with read-modify-write paradigm and registers in general. We will see later that ChibiOS ADC driver exposes some helper macros and constants to compose the sequence registers. The ADC requires to be triggered to start a conversion. Once triggered the STM32 ADC will sample the whole sequence converting subsequently all the channel of the sequence at the maximum rate. Sample rate registers are split into many bit fields each one representing the sampling rate of a channel (SMP0 is the rate of ADC_CHANNEL_IN0, SMP1 of ADC_CHANNEL_IN1, and so on). In such scenario the number of clock cycles will be 3 + 12 + 15 + 12 + 15 + 12 (plus a fraction of a clock cycle due to an eventual misalignment between ADC clock and trigger). The STM32 ADC can be triggered in Software by writing a trigger bit in a control register (usually the SWSTART bit in the ADCx_CR2). It can also be triggered by an external signal which can be injected by the outside world or generated by an internal timer: this option is largely used when sampling shall be performed with precise timing. For this purpose, there are certain General Purpose Timer of the STM32 which have no output channel but only internal lines just to be used as a trigger for the ADC and DAC peripherals: such timers are usually the TIM6 and TIM7. The behavior of the trigger depends on the Conversion Mode of the ADC. If the ADC is configured as Single Conversion Mode (on trigger event) it converts a sequence then stops. If it is configured in Continuous Conversion Mode the ADC starts a new conversion as soon as it finishes one. The ChibiOS ADC driver exploits all the feature of the STM32 ADC to cover a large number of scenarios offering both blocking and non-blocking functions, fully configurable sample groups, circular/linear conversion modes, and configurable trigger. Each API of the ADC Driver starts with the prefix “adc”. Function names are camel-case, pre-processor constants uppercase and variables lowercase. The whole driver subsystem can be enabled disabled through the proper switch in the halconf.h. The switch name is HAL_USE_ADC. To use the driver we have then to assign it an ADC peripheral acting on mcuconf.h. Assigning a peripheral to the driver a new object will become available: ADCD1 on ADC 1 assignation, ADCD2 on ADC 2 and so on. Each ADCDx object represents a driver which implements a Finite State Machine. Each driver operation (e.g. a conversion) can be done only if the driver has been properly started. This requires a call to adcStart(). The adcStart() receives as usual two parameters: a pointer to the driver and a pointer to its configuration. If the driver is not used it can be stopped through the adcStop(). The following figure is the state machine of the driver. The ADC driver offers both synchronous and asynchronous conversion function. We already introduced these concepts but let me recall them. A blocking function blocks the execution of the calling thread until the operation is completed. If the function has some internal wait they are not polled, instead, the calling thread is suspended and the RTOS executes other threads. Such functions are also known as synchronous functions as the calling thread remains in sync with the operation. A non-blocking function launches the operation and returns to the calling thread which continues to be executed. Such operation is executed in the background, usually in hardware, launching an interrupt on operation complete event. Such IRQ usually is exposed by driver API in the form of a callback. Such functions are also known as asynchronous functions. * @brief Performs an ADC conversion. * @details Performs a synchronous conversion operation. * must be one or an even number. * @return The operation result. * @retval MSG_OK Conversion finished. * the result buffer may contain incorrect data. * @brief Starts an ADC conversion. * @details Starts an asynchronous conversion operation. The first parameter is, as usual, a pointer to the driver. Remember that the driver shall be already started and configured through the adcStart before to call a conversion function: this is a common pattern in ChibiOS which I use to call start-do-stop. Anyway, ADC configuration itself is very poor and, in certain driver version, is even empty. This would sound quite strange (especially because we have spent a whole chapter talking about features and configuration of STM32 ADC). This takes us to the second parameter: the ADCConversionGroup. Most of the ADC configuration is indeed demanded to the conversion functions and it is confined in this configuration structure. The logical motivation of this design is that configurations like trigger source, sequence or sample rate are related to the conversion more than to the driver itself. The ADCConversionGroup contains all the configuration related to the conversion group like the trigger source, the sequence, the sample rate and the conversion mode. Let me now jump to the fourth parameter which is named depth. The conversion function allows to sample the same conversion group more than once and depth represent the number of times we want to sample the conversion group. Thus if we consider the conversion group length (M) the first dimension we should consider the depth (N) the second. Thus a conversion function needs a buffer which is actually a matrix M by N which lead us to the third parameter which is actually a pointer to that buffer. The user shall guarantee that the buffer is properly sized to avoid overflow. Note that the sample buffer type is specific of ChibiOS and this allows abstraction on Hardware differences. In this case, adcsample_t is a 16-bit unsigned integer. The data alignment depends on certain configuration we can provide through the ADCConversionGroup. when the ADC has filled the whole buffer. In such a scenario, the buffer is a 3×10 matrix. On the call, the adcStartConvert configures the ADC triggering the conversion and promptly returns to calling thread which continues its execution. From here and out, while the kernel is executing threads, the ADC is converting continuously relying on DMA to fill memory with converted data: this means the only way to get in sync with conversion is to use the end callback. As said this callback will be triggered when ADC (more precisely DMA) has filled the first half buffer: in this case, the ADC has performed 5 conversions and it is going to fill the second half buffer: through the callback when the ADC is doing that we can operate on the first half. Next callback will be on the completion of second-half buffer conversion: here the ADC will start to convert overwriting the first half buffer and we can operate on the second one. This solution allows us to operate in real time on sampled data as long as our operations inside the callback are faster the ADC half buffer conversion. Note that in case of linear conversion callback is triggered only at the end of the whole conversion. Note also that such kind of callback receives certain parameter like a pointer to the driver, a pointer to the buffer currently filled and the size of the converted buffer: this means in circular mode we will receive a pointer to the current half buffer and NxM/2 as size, in case of linear mode we will receive the pointer to the whole buffer and N by M as size. * @brief Stops an ongoing conversion. * being processed then the function does nothing. At the end of the day, the most difficult part in ADC usage is to properly configure the conversion group. This is particularly tricky because STM32 ADC has many variants depending on sub-family and in a certain case on specific Microcontroller. ChibiOS\HAL implements many different versions of this driver to resolve hardware differences. Details related to ChibiOS\HAL design can be found in this article. Currently, there are 4 different drivers version plus a couple of specific ADC driver implementation to cover all the hardware differences across the STM32 subfamilies. From the user point of view, a different driver implementation means different ADC register organizations, different bit mask. By the way, remember that all the hardware differences are confined in configuration structures. In this case, you will have different ADCConversionGroup and ADCConfig while the ADC API itself remains constant. In what follow we are going to take a deep look in the ADCConversionGroup of the drivers ADCv2 which supports the STM32 “advanced” ADC found on F2, F4, and F7 sub-families. This walkthrough, the testhal demos, and the STM32 reference manual should be far enough to understand how to use other driver versions also. Now, the easiest way to use ADC is to copy some snippets of code from a testhal demo. Such demos are under the folder [chibios_root]\testhal\STM32. In such directory, you can find demos for many every STM32 subfamily. Anyway, it is not guaranteed that you will find runs on your development board. Copy from the testhal demo the whole main or snippet of code related to ADC. Resolve eventual differences like a different identifier of LED line. Usually, the demos have more than a configuration: this allows the user to make a comparison and understand how configuration works. Now considering the proposed demo it has a couple of configuration. The first one is the simpler and samples 1 channel linearly triggered by software. * Mode: Linear buffer, 8 samples of 1 channel, SW triggered. This configuration is extremely simple but has a lot of field many of which are empty. What if the user has to modify this configuration to achieve a custom behavior? To create some custom configuration, it is required to investigate the meaning of each ADCConversionGroup field taking a look to how the structure is defined in the ChibiOS LLD code. More in detail this structure is defined in the file hal_adc_lld.h and each driver version has its own file. As example the path of LLD header for ADCv2 is [chibios_root]\os\hal\ports\STM32\LLD\ADCv2\hal_adc_lld.h. As counterexample, the one for STM32F37x is [chibios_root]\os\hal\ports\STM32\STM32F37x\hal_adc_lld.h. * @brief Conversion group configuration structure. * reference manual for details. * @brief Enables the circular buffer mode for the group. * @brief Number of the analog channels belonging to the conversion group. * @brief Callback function associated to the group or @p NULL. * @brief Error callback or @p NULL. * @brief ADC CR1 register initialization data. * @p ADC_CR1_SCAN that is enforced inside the driver. * @brief ADC CR2 register initialization data. * enforced inside the driver. * @brief ADC SMPR1 register initialization data. * @brief ADC SMPR2 register initialization data. * @brief ADC watchdog high threshold register. * @details This field defines the high threshold of the analog watchdog. * @brief ADC watchdog low threshold register. * @details This field defines the low threshold of the analog watchdog. * @brief ADC SQR1 register initialization data. * @details Conversion group sequence 13...16 + sequence length. * @brief ADC SQR2 register initialization data. * @details Conversion group sequence 7...12. * @brief ADC SQR3 register initialization data. * @details Conversion group sequence 1...6.
circular, is a boolean which programs the ADC to work in the circular mode when true or linear otherwise. In linear mode the ADC converts a group one time than stops; In the circular mode, the ADC converts group continuously using the sample buffer in a circular way. num_channels, is an unsigned representing the length of the sequence. This value is used internally to configure the LEN bit field of the ADCx_SQR1 register. Remember that the maximum number depends on hardware as each sequence elements is actually a bit field in the sequence registers. end_cb, is that callback, the one executed when the conversion is completed and, in case of a circular buffer, on half buffer. error_cb, which is a callback triggered on ADC hardware error. cr1, cr2, … crx are the control registers. The driver configures them partially but we can use them to change some configuration like ADC resolution, data alignment or trigger source. sqr1, sqr2, … sqrx are the sequence registers. smpr1, smpr2, … smpr3 are the sample rate registers. To compose registers value we can use the bitmasks already defined in the CMSIS header files. Such files contain all the definition of every bit field of every register of our MCU. It is possible to find under [chibios_root]\chibios_trunk\os\common\ext\ST\. Each MCU has is own CMSIS header file as the register map changes with a microcontroller. As example the file for the STM32F401RE is [chibios_root]\chibios_trunk\os\common\ext\ST\STM32F4xx\stm32f401xe.h. What follows is some bit masks definition for the ADC registers. Note that has some ChibiOS drivers already uses those bitmasks internally, the proper file for the micro in use is already included. The ChibiOS/HAL drivers often offer some additional helper. For example, the ADCv2 defines identifiers for the input channel channels. #define ADC_CHANNEL_SENSOR 16 /**< @brief Internal temperature sensor. #define ADC_CHANNEL_VREFINT 17 /**< @brief Internal reference. #define ADC_CHANNEL_VBAT 18 /**< @brief VBAT. We can notice that the first 16 channel are called generically ADC_CHANNEL_INx which is, by the way, the same name adopted in the STM32 documentation. Such channels can be connected to the outside world through GPIO and this can be done configuring PIN as Analog Mode. If you do not remember how to configure GPIO through PAL take a look back to the article Using STM32’s GPIO with ChibiOS’ PAL Driver. The others, instead, are extra channels connected to internal peripherals. * @brief Number of channels in a conversion sequence. Note that macro perfectly shows to which register belongs each bit field. For example, the ADC_SQR2_SQ9_N states that the ninth element of the sequence is a piece of the ADC Sequence Register 2. Note that we do not have to configure the LEN bit field in the ADC_SQR1 because the driver already does it internally starting from the second parameter of the conversion group (num_channels). To conclude, note that resolution can be configured acting on bit24 and bit25 of the ADC_CR1 and when those bit are set to 0 ADC resolution is set to 12-bit. There are many other configurations we can achieve acting on control registers. A user interested in this should take a look at the microcontroller Reference Manual to understand how to handle those register. A commonly used “advanced” configuration is the external ADC trigger which allows triggering each conversion group with an extremely precise timing using a general purpose timer. 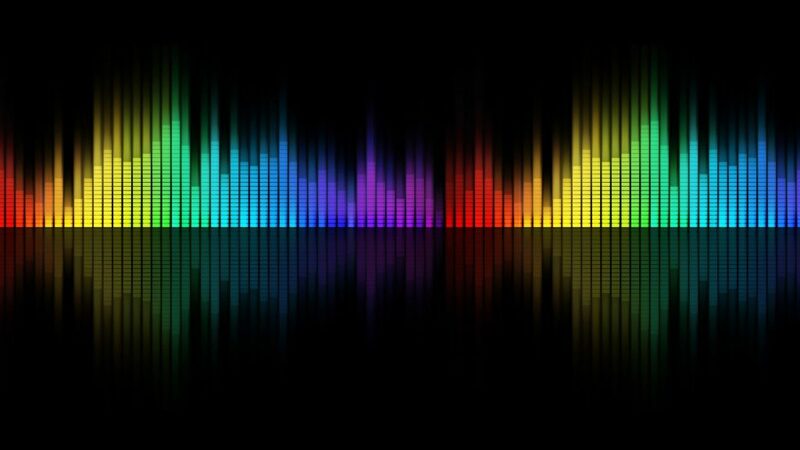 Such kind of configuration is widely used in the audio applications where certain formats like PCM require that audio signal is sampled with a specific cadence (44.1kHz, 48kHz, 96 kHz, …). ChibiOS already provides a demo ADC+GPT under testhal. Moreover on the download page of this website you can also find a porting of this demo for the STM32 Nucleo-64 F401RE. We have already planned a collection of example and exercises for the ADC driver. If you are interested in following us on Facebook to be updated on our articles. Anyway, at this moment you could refer to the ADC demo under testhal to give it a try. Using STM32's ADC with ChibiOS ADC Driver, to deal with Analog to Digital Converter of the STM32. Using STM32 SPI with ChibiOS, to understand how to deal with Serial Peripheral Interface of the STM32. Using STM32 I2C with ChibiOS, to understand how to deal with Inter-Integrated Circuit bus of the STM32. On PLAY Embedded we are using cookies. Anyway you privacy is safe! Read our policy!